A carefully crafted Business Plan is one of the most valuable tools in helping entrepreneurs reach their business goals by giving direction and defining objectives. A business plan is helpful in assessing the efficiency of strategies and helps the start-up to benefit from oncoming opportunities. Entrepreneurs can refer to the business plan as a guide that helps prevent and manage problems that may arise on the way to success. Developing a business plan is a time-consuming process and it may be tempting for an entrepreneur to neglect planning altogether but the time spent in drafting the plan gives you an excellent opportunity to learn more about the industry and competitors. Although the time spent cannot be monetized upon, the benefits of a well devised business plan far outweigh any temporary financial losses. Plenty of start-ups begin without a business plan relying on their optimism and confidence while others get so involved in operational tasks that they neglect the idea of planning itself. What these businessmen fail to understand is the fact that operating without a business plan is much more time consuming and less efficient than working as per a set plan of action. One great thing about a business plan is, you may refer to it as a map which provides a reference point that you may need to return to just in case you go astray. The plan shall show you how far you have managed to come and even get you back on track if you drift away. Used as a management tool, the plan can ensure that the business is on track with set operational milestones, sales targets and meeting goals. A business plan gives you a clear image of your company as of now and what it ideally should be over a set period of time. It describes your company, products or services offered and the factors affecting future growth in both directions. The business plan marks your starting point, evaluates where you stand now and helps you with a vision of tomorrow. Following a business plan makes it easier to adapt with market changes, trends and innovations and helps you reach your goals efficiently. A self-descriptive business plan that clearly mentions statistics, facts and figures with detailed description of potential growth and profits, persuades investors and financial institutions to provide the necessary capital for an entrepreneurship. A business plan is essential to attract executive level employees, business partners and helps in securing bonds with dealers, suppliers and retailers. It also designates titles and roles to each individual and by allocating a set of duties for each one to perform, simplifying the entire process. Starting, owning and managing a start-up business by optimum utilization of local resources for the development of a rural population is what rural entrepreneurship means. We have seen an influx of rural migration into the cities in search of employment, resulting in overpopulation in the urban areas. To prevent such a situation and to minimize migration owing to unemployment, we need to create situations that create opportunities of employment in the rural areas itself. Value addition to rural resources in rural areas, engaging rural human resources is Rural Entrepreneurship in its truest form. In countries like India, the need for rural entrepreneurship is very strong and the reasons are, employment generation, income generation, rural development and making villages self-sufficient. Doing so will invariably prompt the villagers to earn and live where they belong rather than moving to bigger towns and cities thus curbing rural to urban migration. An ideal situation would be when citizens from cities and towns find it worthwhile to shift themselves to rural areas looking at the vast possibilities and opportunities that are waiting to be tapped. Young people with a creative and positive perspective, who aim to work towards the development of rural areas using rightly channelized efforts will be the ones to bring about a drastic change in the situation we see today. These dynamic rural entrepreneurs shall be successful in solving many such chronic problems within a short time span and make a mark in the industry while doubling their profits. The rapid growth in population and an even faster rate of urbanization creates an increase in demands which are challenging for the traditional small-scale businesses who cannot cope up with the demand and supply cycle. This is where new and innovative solutions of an entrepreneur come in. Bringing in all-new global concepts, business strategies, information technology and a highly efficient infrastructure, the entrepreneur would have all the right tools in hand to chisel out one of the finest masterpiece in rural entrepreneurship. Most of the industries in the rural sector are small-scale and cottage industries with a huge potential for growth. While being quick yielding they also provide large employment opportunities, which indirectly means, a smaller gestation period and cheaper labour as compared to the urban industries, ultimately resulting in better profit margins. A host of opportunities are open for rural entrepreneurs and the categories they relate to are Food processing and Agro products, textile industry, cottage and handicraft industry, mineral based industry, engineering related and service industry. Individual entrepreneurship, which is a proprietary concern and a single ownership of an enterprise. Group entrepreneurship is a partnership and can also be a public or private limited company. Cluster formation relates to associations consisting of a group of individuals sharing the same interest, religion, caste or occupation etc. which are known as Non-Governmental Organizations (NGOs), Voluntary Organization (VOs), Self-Help Groups (SHGs), Community-Based Organizations (CBOs) and networking of all these. Co-operatives are autonomous associations of persons united voluntarily for a common purpose. It is not necessary that those who prefer rural entrepreneurship need to be from rural areas themselves. Enterprising urban citizens who are earnest and sincere enough to ensure and manage rural development must take up innovative projects and also promote the benefits of rural entrepreneurship to others. YES Bank makes its first institutional tie up for lending to start-ups, had joined hands with Gandhinagar-based Entrepreneurship Development Institute of India (EDII), a national resource Institute for entrepreneurship education, research, training & incubation. YES Bank provided Rs 50 lakh to EDII incubated startup – Green Ideology, maker of India’s first organic antimicrobial lingerie brand ‘Inner Sense’. “Start-ups are critical to the growth of the economy. As an extension of our YES Head-Startup program, we have collaborate with EDII to help start-ups scale up and grow rapidly, thereby creating a multiplier effect on the Indian economy” said Rana Kapoor, Managing Director and CEO, YES Bank. Founded by Abhishek Lodha and Neerja Lakhani in 2013, Green Ideology has introduced India’s first organic antimicrobial lingerie brand ‘Inner Sense’, claims EDII statement. Green Ideology had initially received a grant of Rs. 5 lakh from the Government of Gujarat acting through its nodal institute EDII, to commence its operations and launch its product range. With the Rs 50 lakh debt funding from YES Bank, the start-up will now scale-up its operations. YES Bankis providing the loan under the CGTMSE program (Credit Guaratee Fund Trust for Micro and Small Enterprises) to the startups. “EDII has been mentoring and supporting start-ups. But, our ability to lend to these start-ups was miniscule as we are an educational institute. Now, in association with YES Bank, EDII is in a position to provide debt to many of the start-ups whom we support in various ways” said Sunil Shukla, Director, EDII. 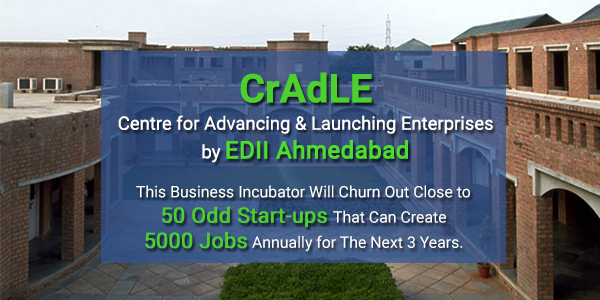 EDII’s recently set up technology business incubator, CrAdLE (Centre for Advancing & Launching Enterprises), headed by Infosys cofounder S Gopalakrishnan as its first chairman, is also nurturing start-ups in the fields of manufacturing, food & agri business, renewable energy and healthcare. Do family businesses score over nonfamily businesses? Family businesses go on for generations together. This gives them an easy advantage over non-family businesses as they have deep industry knowledge of what’s happening currently and the past trends too. That’s not all, they have the commitment and passion towards the success of the business and the industry knowledge helps them to take informed market-focused decisions. Dedication and passion towards the business goal: In a family business, often non-family members too are treated as a family. This strong relationship built with the employees and other stakeholders result in fruitful daily operations as everyone works towards achieving one goal. While the owners tend to take better care as they have their stakes involved in the company, it makes a huge difference when the employer is appreciative of the employee’s talent. Decision making: Not having responsibilities towards any shareholders gives the Indian family businesses greater flexibility in terms of making decisions faster, improving the speed with which they launch new initiatives, change operations, evaluate new business opportunities, etc. Industry insights: Family businesses work in one industry for longer durations. This gives them significant experience and expertise. They understand the pulse of the market and their consumers well over non-family businesses. This makes them ready for any challenges. Mutual trust: Family businesses thrive on mutual trust and believe in maintaining long-term relationships by providing a conducive, supportive and trusting work environment. Family businesses take pride in their contribution towards providing a greater balance and stability to the economy and are more likely to take greater risks than the non-family businesses. While there are downsides of the family business, it’s their industry knowledge that keeps them going generations ahead! How family businesses can keep the entrepreneurial fire burning? We know of entrepreneurs today who kicked their 9-5 job as they wanted to be their own boss! They had absolutely zero entrepreneurship background but still made a remarkable benchmark in their field of business. But there are individuals for whom it runs in their family. These individuals have decided to take up entrepreneurship because they have grown up seeing their family run a business of their own. It shows that it is not impossible for family businesses to keep the entrepreneurial fire burning. While the next generation may not have the same spur in them as the founder of the business. The key is to keep EVOLVING. Knowing the history of family business: When an Entrepreneurial Legacy is passed on, it is important to know for the current gen or the next gen handling the business to know where it started from and what their ancestors did to run the enterprise. A study conducted by King’s college in London where they studied 21 family businesses showed that lack of knowledge has actually proved to be a loss for the business. Whereas, the businesses who had proper understanding of the history, compared the past and present and accordingly innovated and hence they were able to make profit. Youngsters get started early: When the young generation is taking over the family business reigns, it is important to involve them early in key decisions. At the same time, it is important to give them a chance to make mistakes and learn from them. It gives them a room to innovate and explore their strengths and weaknesses. Making practical education mandatory: While there are individuals who have the entrepreneurial traits in their genes, it is important to get a global perspective of businesses which is only possible through education in a recognized B-school and on-the-job learning in other companies. Learning from the younger generation: As we mentioned, the key to a successful business is to evolve. The young generation will have ideas of their own. Allow them to explore and the current generation handling the business will have to learn with them. This helps the organization to keep up with the changing trends. Also, everyday is a new learning! So, if you have an entrepreneur in the family, tell them the tales of your business and motivate them to take your legacy forward. For the next gen who are looking at taking over their family enterprise, get to the roots first and you will know how to take it forward!